Ok, so its not quite on par with "that" picture of Cory Richards from the recent film/documentary "Cold" (view trailer here) but it was the start of my introduction to Winter Mountaineering and to my winter skills course with Talisman Mountaineering in the Cairngorms, Scotland. The idea for doing this started about 6 months ago after the last trip to Scotland and our climb of Ben Nevis via the CMD (read blog entry here). We'd both decided that we wanted to do something "a bit more challenging" and we also wanted to become more confident in the hills, in a more alpine setting, so that we could start to look at challenges further afield (French Alps, Canadian Rockies) with a view to exploring these in 2012. A course seemed the best, and safest, way to enhance our skills and to get the best out of our first Scottish Winter experience so we started to look around for a 5 day course that we could take over the Christmas Break. Slightly off topic but we decided to go back to the B&B/Guest House that we'd previously stayed at in Scotland; Crubenbeg House, located near Newtonmore about 20 minutes from Aviemore, is a fantastic place to stay - the owners, John & Irene, are friendly and accommodating and the food is amazing! So it was with slight apprehension that we arrived at Crubenbeg House on Boxing day, I say apprehension as the previous fortnight of heavy snow had given way to high winds and only a few days before Cairn Gorm registered the 2nd highest wind speed ever recorded on its summit at 165mph! Our arrival into the guest house was accompanied by gale force winds and the sight of a number of fallen trees. But at least we were there and the cup of tea and home made cake from Irene was greatly appreciated - then there was time to unpack and get ready for the next 5 days of "winter skills". 9:30am found us at the designated meeting point, outside the Mountain Sports Cafe and shop, both feeling slightly nervous but at the same time excited at the prospect of getting out in the hills again - but with added snow! A quick meet and greet with Ron (Talisman Mountaineering) and the other 2 members of our group for the week and we were off to the Ski Centre car park on Cairn Gorm. It was here that we kitted up and sorted crampons, axes and helmets and chatted about the various kit items that we'd need to ensure we had at all times to be ready for the Scottish winter. From the car park we had a leisurely walk in to Coire an t-Sneachda which gave us all a good opportunity to get to know Ron and the rest of the group. On our walk in Ron was interested in my choice of top (Montane Extreme Smock) and suggested that it performed best worn next to the skin and not with the thin base layer that I was currently wearing - so I took the leap of faith and removed this, which was by far the best decision I made that week (more about that in the reviews later). Our first patch of snow gave us the ideal chance to practice some ice axe arrests and to get used to walking on snow with our winter boots on (my choice of boots for this trip, on recommendation by Pegglers, were La Sportiva Nepal Extreme's) and learning the different moves required to stop a slide down an icy, snow covered slope. After a quick lunch (note - its worth making sure that the food you take into the hills in winter wont freeze up on you - snickers bars are not ideal as I found out!!) we headed a short distance to a ridge (around 10m high) that isn't actually marked on the map, presumably as it falls between the contour marks on the map, but that is steep enough to practice use of crampons and cutting steps with our axes both on the ascent and descent of the slope. Walking with crampons is not actually too hard, once you get used to having to walk like John Wayne - so as not to rip gaiters and expensive waterproof trousers. Which is exactly what Donna managed to do, accompanied to the hooting of Ptarmigan - thank god for duck tape! Practicing emergency shelters in the "neve"
The second day dawned very windy but my initial concerns of the day being cancelled were dispelled after meeting Ron and Fi (who was to take us on the snow holing trip later that week) but Ron was quick to point out that the MWIS forecast for the afternoon wasn't looking good so the activities would probably be limited to the morning. After checking the top car park at Cairn Gorm we headed back down the mountain slightly to the car park near to Coire na Ciste which although windy was sheltered enough for us to get out of the cars and head across the wet heather to another sheltered slope covered in snow. The smock was due for a real test today as strong wind and rain were forecast for the day so I could only hope that Ron's enthusiasm for its all-weather properties were right! We practiced the use of ice axes to dig emergency shelters - it's amazing how quickly you can dig out a totally protected shelter for 1 or 2 people that can be a real life saver in an emergency situation. After checking the avalanche risk of the slope we were on we set up and practiced using the randonee rope (or hill-walkers confidence rope) for seat-belays and the use of differing styles of self belay for getting down steeper slopes or over cornice's - South African style was by far the most comfortable but generated so much friction that it's best not to be in any sort of hurry when using this method! By 2pm the rain was pouring down and the wind had really picked up so we headed back to the car - by which time we could hardly open the car doors due to the strength of the wind. The third day of our course brought with it reduced wind and, finally, snow! 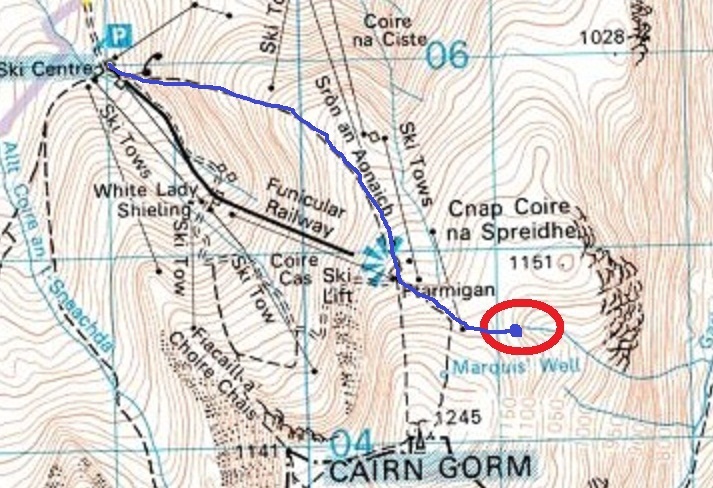 It was a quick meeting at the mountain sports cafe at 9am and then off to the top car park at Cairn Gorm for our walk along the ski tows and up onto the ridge of Fiacaill a Choire Chais. By the time we reached the summit of Cairn Gorm (or the weather station at least) the weather had really turned and the snow and wind had reached the closest to a blizzard that we had yet encountered - conversation was down to a minimum now and we pushed on ahead to a fairly large coire at the top of the stream head (circled in red below). Navigation was key here as visibility was down to almost nothing and none of us wanted to walk over the cornice that Ron promised would be lurking for us at the top of the coire! Once we'd descended into the coire we ran through avalanche risks and detection again and set about digging the start of our snow holes that we'd hopefully be spending the next night in! Day 4 - Friday 30th December 2011 - Snow Holing! Packing for day 4 and 5 was interesting as we'd had to add bivvy bags, sleeping bags (both courtesy Alpkit), stove and food to our already stuffed packs and the trusty old Deuter 45+ was struggling! The casualty of the day was Nick as his hired Scarpa plastic boots had rubbed his feet raw so he had to duck out of the next 2 days which was a real shame. Seeing as Tim had left the course at the end of the 3rd day it was just going to be Donna, Fi and I for the snow holing trip. Parking up at the Ski Centre car park again we headed off up the Ptarmigam cafe via the path to the north of the ski centre (shown in blue on the above map) and then across to the snow holes that we'd started digging the day before. Here was a good test for my trusty Garmin Edge 601 as I'd saved in the location of the snow holes in the way-point memory so we followed this back to the site to see how accurate the device was - the result was very, down to about 1m which saved a lot of probing with the avalanche probes. 4 hours later we'd pretty much finished the digging and had the 2 snow holes (one for Fi and a slightly larger abode for Donna and I) and were now making the finishing touches like smoothing off the ceiling to avoid drips and cutting notches in the walls for candles. The light had all but disappeared now so we'd planted the avalanche probe outside in-between the 2 entrances with a long-burn glow stick hung on the top which had the dual purpose of altering a rescue team in the event of a cave-in but more importantly it allowed us to find out way back as and when nature called in the night! We unpacked and settled in for the night - this was going to be the first real test for my Alpkit SkyHigh 1000 sleeping bag and I had high hopes for it - firing up the stove and cooking dinner and a hot drink while sitting wrapped up in layers of PHD down clothing. It was only when I popped out for a few minutes that I noticed the boot prints in the snow left by Donna and Fi about 30 minutes ago had almost turned to slush and rain was starting to fall lightly - worrying? 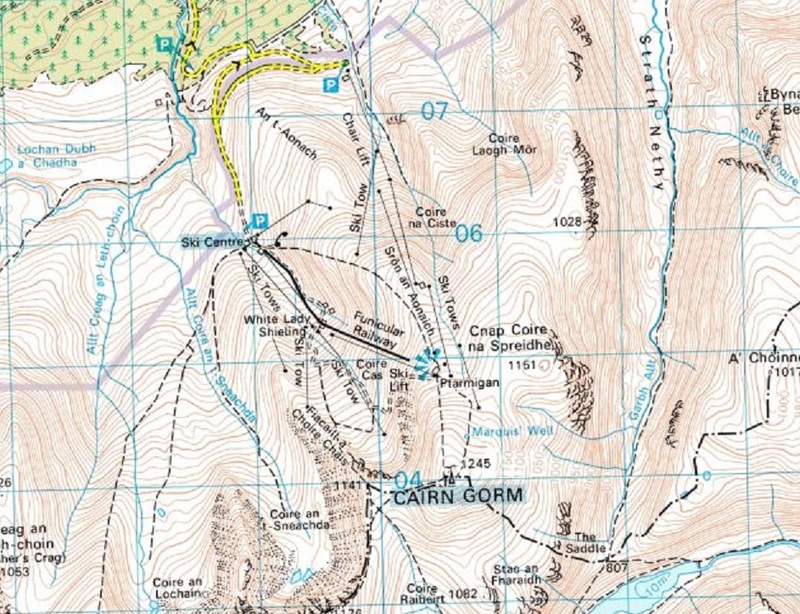 A txt and then phone call from Ron to Fi a few minutes later confirmed that an area of high pressure had moved in on top of Cairn Gorm (an inversion) pushing the low pressure down into Aviemore; this resulted in Aviemore, 800m lower, being 6 degrees lower than the summit - very odd! More concerning for us was that fact that the snow was starting to settle and the snow holes we were in were slowly shrinking - the communication hole between the 2 holes had lost 3/4 of its size in around an hour. Basically what was happening was that the air in the fresh snow was escaping and settling into ice - not ideal for the night in the snow! 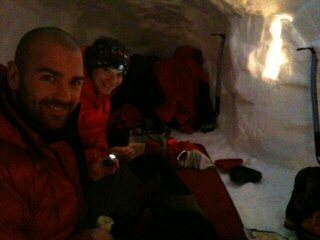 So at about 8pm Fi made the call to pack up and head down and as we didn't fancy waking up entombed in snow and ice we both agreed! By the time we'd headed back down to the car park the temperature was reading 6.5C and the skiing runs that were in use on our way up the mountain earlier in the day were now down to bare mud and slush and even more strangely the temperature in Aviemore 20 minutes later was 2C and snowing! So there ended our course as we'd decided to take the Saturday (New Year's Eve) as a rest day and explore some of the Munro's close to the B&B - at least we would be guaranteed a great cooked breakfast back at Crubenbeg House, which was a far better prospect that a cup-a-soup and hot chocolate on the Primus stove! The rucksack Fi had was a Crux AK 47 and not the AK 57 which is more than adequate when using an ultra light 4 season down bag such as the PHD Hispar 500. In fact climbing in the Alps we can get all our bivvy kit, including ice and rock climbing gear and ropes, into the bag along with a tent and several days food! If travelling or climbing really light the PHD Yukon Smock, bivvy bag, micro gas stove, mug and spoon and a short section of Karrimat does the overnight trick. The stove is used to melt snow for water which is the real killer when it comes to cutting down weight. It all weighs less than a half lire of water yet can melt over 12 litres of snow saving us 12 KG of weight!!! It all fits into a 35 litre sack along with the climbing kit!!!! Thanks Ron, I think I need to refine my packing skills a little bit - and maybe look at a smaller down bag! !